Living so near Zion’s national parks, I see a lot of different campers in the parking lots of Costco, Cracker Barrel and Walmart. 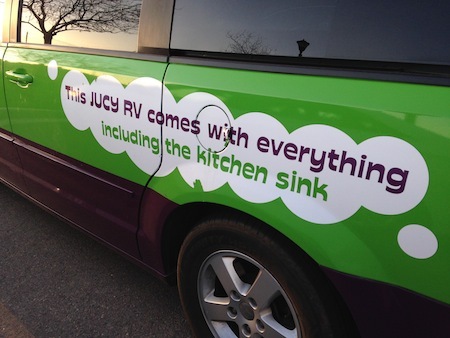 Lately, I’ve been seeing these cute little green and purple camper vans from Jucy Rentals. I saw this one in the Cracker Barrel parking lot a few months ago and I loved it! 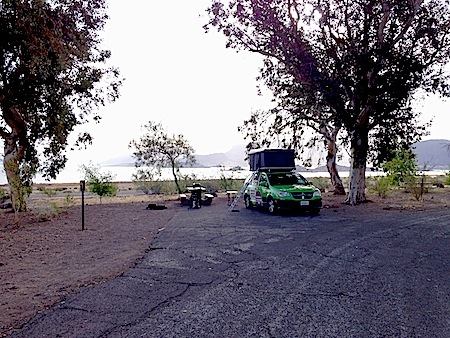 It looked like what I have talked about doing for a long time by putting a popup tent on the top of a car and building a galley out the back. 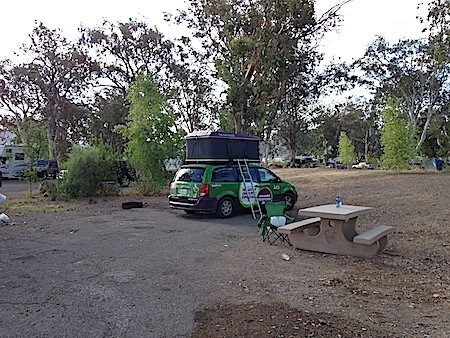 After I saw this camper, I looked them up online and they originated from New Zealand and have just barely came over to the States. They truly have a brilliant design. 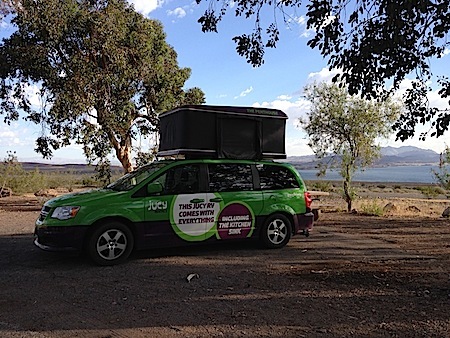 Here’s a video that shows you all the features of the camper. Skip to the 2:11 minute mark to see the camper features. 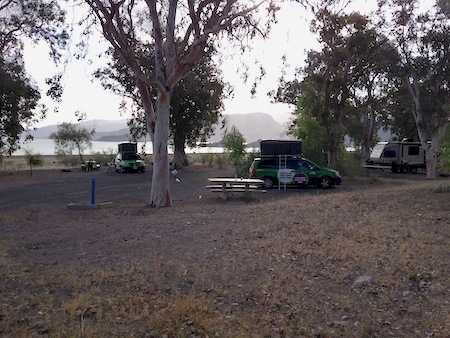 When I was at Lake Mead a few weeks ago, I saw two Jucy Rentals. 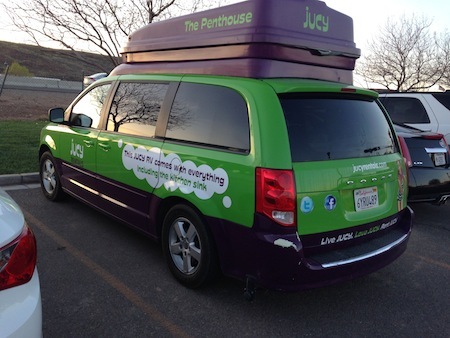 The reason why I am seeing so many of them lately is because Jucy has a rental location in Las Vegas, Nevada. I never saw the campers, but the top beds looked like they were pretty roomy and comfortable. 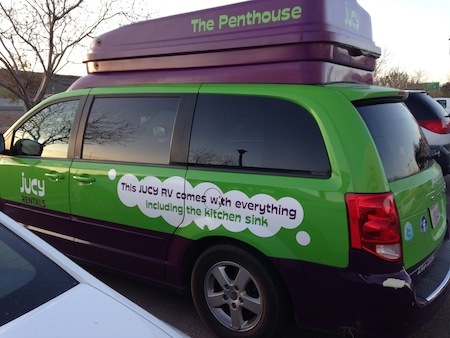 Ironically, seeing these campers everywhere doesn’t make me want to rent them. It makes me want to make a camper van of my own. Of course, renting them is really reasonable. 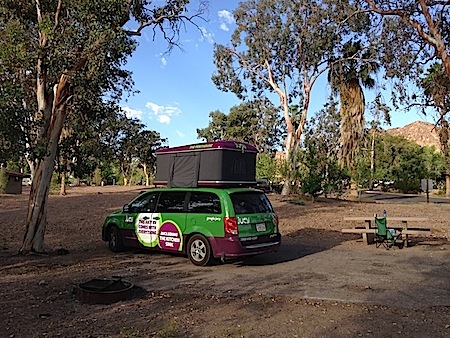 When it costs nearly $200 a day to rent the smallest of motorhomes from Cruise America, $70 a day sounds pretty good. When what you’re renting is a cute little van that’s hilariously easy to drive, even through a fast food drive-thru, then you’ve got yourself a deal!